A. 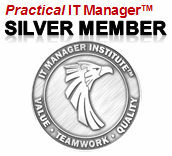 SILVER MEMBER – New training every month plus samples of our other IT Manager resources. Available in monthly or yearly subscriptions. B. 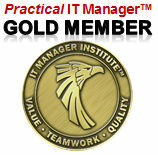 GOLD MEMBER – Access to my entire IT Manager Resources Library except for the IT Manager Institute and ITBMC Program. Over $6,000 in resources plus new training and tools every month. Available in yearly subscriptions. 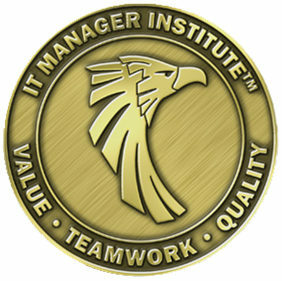 C. SELF STUDY MEMBER – 1-year access to my IT Manager Institute & ITBMC Certification SELF STUDY Program and free tuition to the 3-day WEBINAR program I deliver several times a year plus BONUS resources valued over $1,000. Take a look at the short PLATINUM OVERVIEW video below. 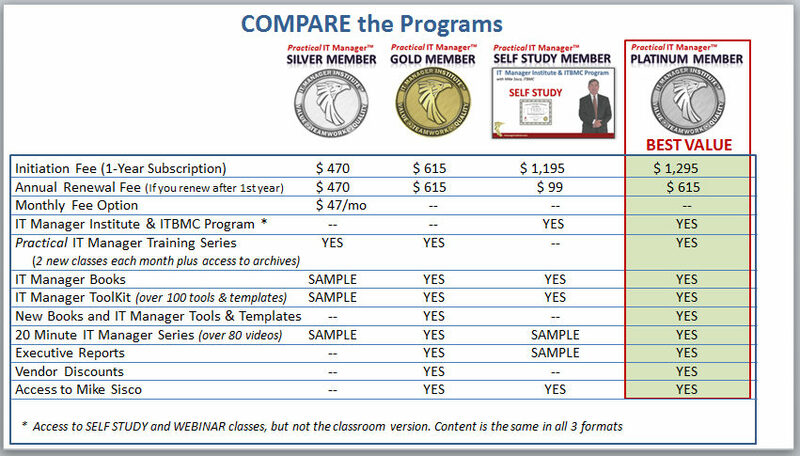 1-year access to everything we have – GOLD MEMBER plus SELF STUDY MEMBER status. Earn your ITBMC Certificate and receive access to everything we offer today plus all new resources we create while maintaining MEMBER status. 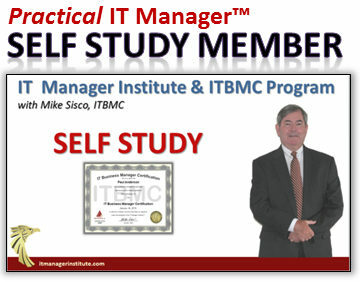 1-year access to the IT Manager Institute & ITBMC Program – attend either the SELF STUDY Program or the 3-day WEBINAR class and earn your ITBMC Certification, , , or attend both in your Membership Year. Our flagship training program is all new with a fresh look and updated content. 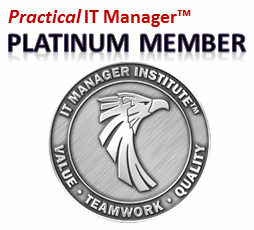 Over 1,000 IT managers from all parts of the world have attended the program with 100% positive feedback since 2003. 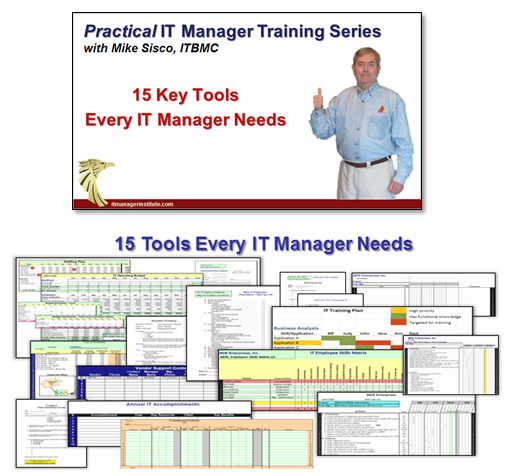 Annual or Monthly subscription gives you access to all my IT Manager Resources Library except for the IT Manager Institute & ITBMC Program. 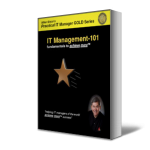 This library grows with new training material and other resources added every month plus the IT Manager archived resources have a retail value of over $6,000. 3. Tools and Templates – The IT Manager ToolKit contains over 100 tools and templates that can be used “as is” or customized for your specific needs. Plus, receive all new tools as they are added to the resources library. 4. 20 Minute IT Manager Training Series – Access my entire set of 20MITM training containing over 85 training sessions plus all new classes added to the resources library. These classes make great “lunch and learn” topics or create an employee training curriculum from the available topics. 5. Executive Reports – Access Executive Reports on Due Diligence, IT-Business Disconnect, and Acquisitions plus new reports added to the resources library. 8. Special GOLD MEMBER ONLY Training – Training is provided for GOLD MEMBERS ONLY to enhance your membership experience. 9. Locked in subscription rate – Your rate will never increase as long as you maintain active status. 10. 3rd Party Software and Services Discounts – Special discount offers and services from recommended resources to help you achieve more success. 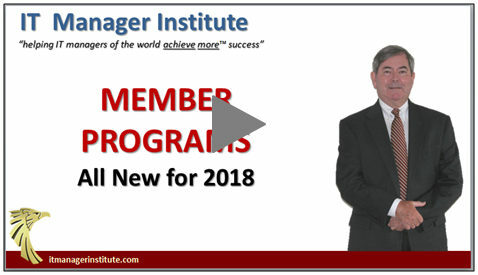 Annual or Monthly subscription gives you new Practical IT Manager Training Series training delivered every month plus the growing list of training added to the Training Archives. 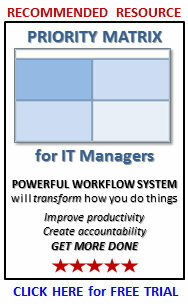 You also receive access to samples of our other IT Manager Resources. Powered by MDE Enterprises, Inc.